What they don’t tell you about being pregnant! One of those things in life that have been extensively talked and written about. Every single person you meet in the course of your pregnancy will have at least one piece of advice for you because the world cares immensely for that unborn baby inside of you and they want you to be careful and loving and nurturing. There are, however, things that no one will teach you singularly. This kind of knowledge, these epiphanies, come to you with experience and living through these experiences personally. Now in the third trimester, I have read ‘What to expect when you are expecting’ cover to cover twice. Although the book is highly extensive and detailed, there are so many things it did not warn me about in advance. This far along the pregnancy, I have come to realise these things! Yes!All these big brand-houses making you want to buy maternity clothes as soon as you hit the second trimester have been fooling you all along. You and your ‘baby bump self’ will need new clothes but only if you intend to do a full-blown 7 schedule photo shoot of yourself with different clothes on. Bodies do not change overnight for most women. The change is more gradual and for most part of the pregnancy, your regular sweatpants and t-shirts will fit the bill just fine. If you still feel the need to own clothing options that were specially made for pregnant women, buy yourself a couple of pretty wrap dresses, kaftans and some bright flip-flops. That should cover you just fine and will also come in handy later. Most expecting moms will agree with me on this. There are days when your house-help just decides to skip work without prior notice and you are left blindsided. Now all you are doing is worrying yourself sick about the laundry that needs to be cleaned and the entertainment centre that needs to be dusted. You will call her and scream your lungs hoarse asking her to never show up on your door again but again your fatigue takes over the adrenaline rush you just had in that fit of rage and more often than not you find yourself calling the maid back the next minute politely asking her when she will show up next. After your husband, the maid will probably be the most important person who will provide you solace – especially in the first and the third trimester. Before you argue that most books and pregnancy related websites will tell you that all baby bump sizes differ, hear me out. No matter how prepared you are, your calm mental demeanour takes a real hit when your seventh month bump pretty much looks like a fifth month bump. 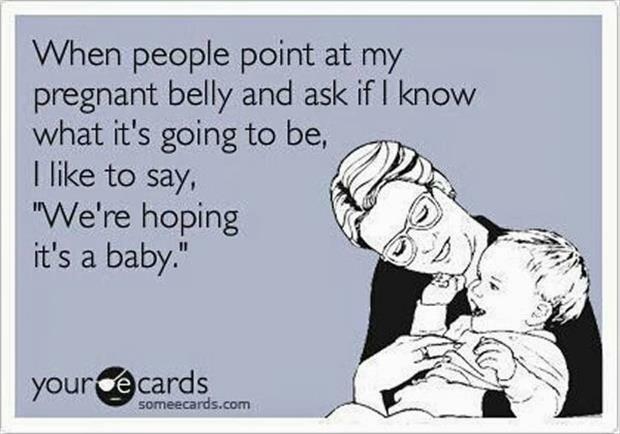 And when you compose yourself, there will be a whole army of people you know who will unabashedly point it out to you that your bump does not look quite ‘there yet’. You will do the unthinkable to prove them wrong. You will arch your spine leaning backwards so your bump protrudes to the front and you will constantly place your hands on the top of the belly to make the bump look more pronounced. Believe me, the pressure of looking the quintessential pregnant woman is so much more than anyone makes it to be. Contrary to popular belief, women on the heavier side (read fat) have swift pregnancies when compared to their skinnier contemporaries. I speak of this through personal experience. Since we have spent a large part of our teenage and youth manoeuvring our ‘big’ frames, the time when the pregnancy bump starts to grow it does not change our centre of gravity as drastically as it does for other women. Moving around with an additional 15-20 pounds seem like a no-brainer and major distress in the back and the legs are things of fiction. 5. The husband tiptoes around you, the world does not! The world around you in general becomes a lot more vocal and judge-y when it comes to you. While your husband (and in a lot of cases, your families) tiptoe around you and speak to you with caution, others have a major flapback tendency of not doing so. Filters are forgotten and so are boundaries. So there will be tummy-touching, no matter how uncomfortable you tell them you are with it. You get the old ‘stop being silly’ jibe from them before they proceed to do exactly what you had forbade them to do a second ago. Advice will be hurled at you from all quarters so teach yourself some head-bopping and polite nodding to be used in such situations. Do not even try to avoid this phase cos the world is the self-appointed guardian of your unborn baby and at the end of the day, they do mean well. No matter what is said and done, at the end of the day, the love of your husband and your families is what keeps you going. Through the sleepless nights and bouts of weird dreams that you have and through the many mood-swings and weepy mornings that you cannot get over, they live it all with you. So as long as you are pregnant, make them your world and prioritise your energy on keeping yourself and the baby healthy. Everything else will fall into place. And anything trivial will automatically fall behind.